Whether you're a Lincoln fan or a railroad fan or both, you would be impressed by this exquisite model of the Abraham Lincoln funeral train. Crafted by Dr. Wayne Wesolowski, former chemistry professor at Benedictine University in Lisle, Illinois, the accurate one-twelfth-scale model features portions of the funeral train which carried Lincoln's body from Washington, D.C. to Springfield, Illinois, in 1865. The model is now owned by the Abraham Lincoln Presidential Museum in Springfield, Illinois. The model, stretching almost 15 feet long, took nearly four and one-half years to construct and represents thousands of hours of model building time. 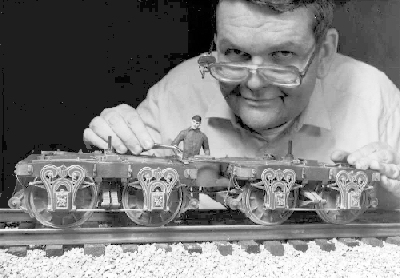 Wesolowski, who is a well-known railroad enthusiast, model builder and author, spent two years researching the funeral train and its route, and has become such an expert on the subject that staff members from the National Archives refer researchers to him for information. Wesolowski's model features the United States shown above. It was the presidential railcar built for President Lincoln but not used while he was alive. Lincoln was scheduled to test-ride it on April 15, 1865, the day he died. The model includes 725 tiny parts which compose the wheels and undercarriage (Wesolowski has documented every one of them). The original car, one of the most opulent of its time, was built in Alexandria, Virginia, and was accidently destroyed by fire on March 18, 1911. Wesolowski chose the historic Nashville locomotive to model (shown above), which pulled the train between Cleveland and Columbus. About 20 different locomotives were used on the 1,666-mile journey. The Nashville boasted three historic photographs for reference, which Wesolowski says is "three times as many as most of the others." He incorporated all the complex engineering features in his model and constructed the frame from hardwood. In addition, Wesolowski built a model of the incredibly elaborate horse-drawn hearse which carried Lincoln's coffin in the Springfield funeral procession -- a vehicle loaned for the occasion by the mayor of St. Louis. Wesolowski created his model almost exclusively of plastic. He also made a miniature copy (1/12 size) of the silver plaque on Lincoln's coffin, having created it through a chemical photoengraving process with help from the Illinois Funeral Directors Association and the Illinois State Historical Library. It's a perfect reproduction right down to the tiny leaf pattern around the edges -- but you need a microscope to read some of the writing. As he observes in his understated way, "Chemistry is very useful." He and his wife Mary Cay also have written a 36-page illustrated booklet entitled The Lincoln Train is Coming, which describes the original funeral train and the process of building this model. 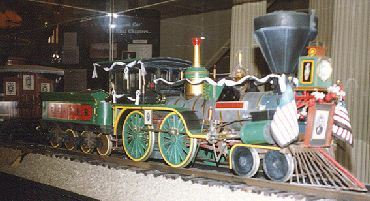 Wesolowski has built two other models of the Lincoln funeral train besides the original, including one on display at the National Museum of Funeral History in Houston, Texas. 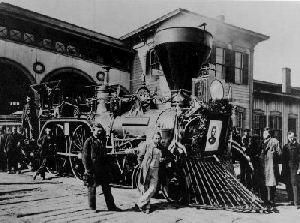 The locomotive Nashville of the Cleveland, Columbus and Cincinnati Railroad pulled the Lincoln funeral train for part of the 1,666-mile distance from Washington to Springfield, Illinois. It was bedecked with bunting, special black fringed presidential flags and a portrait of Lincoln. For those who wonder if your ancestor was an Honor Guard accompanying Lincoln's coffin to Springfield, Dr. Wesolowski offers an official list of the Veterans Reserve Corps members. These 29 men were the only ones allowed to move the coffin from place to place during the long funeral journey. All were sergeants except as noted otherwise.